Why buy a piece of software when other developers make similar software for free? We’re living in a world where altruistic developers make software for the sake of progressing technology, and we should learn to support these people who attempt to help us save some cash while using a program that can easily cater to our needs. 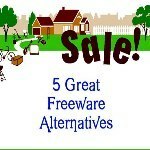 Instead of shelling out cash or resorting to pirating, you can download free alternatives to every application you use, some of which are even open source. Let’s look at the list! Instead of purchasing Nero – which uses a ton of resources – or Alcohol 120%, have a look at ImgBurn, a piece of freeware that allows you to burn CDs and DVDs in a jiffy. Unlike its name suggests, ImgBurn is a more comprehensive burning application that allows you to write any data onto a disc. You probably won’t need data writing in Windows 7, but it’s a decent feature if you’re using an older computer at any point. Windows 7 comes with native CD burning capabilities, but no image burning. Windows 8 will add native image burning capabilities to this, rendering this program useless in the new operating system. For now, until you decide to upgrade, you can use ImgBurn for all your burning necessities. Download it here. You can actually monitor your network comprehensively and diagnose it. Give it a try by clicking this link. free software, maketecheasier.com freeware. permalink.